Want your hood "aggressive-looking"? 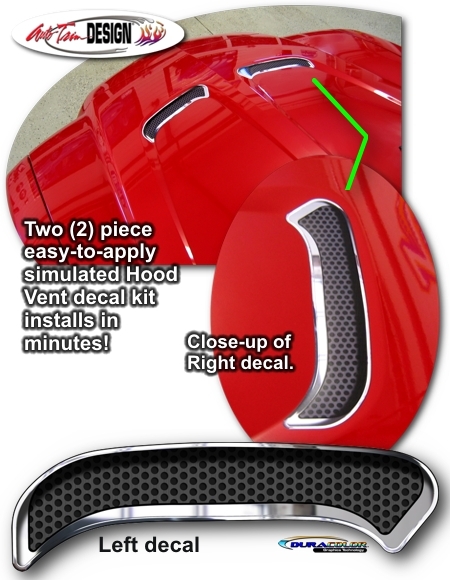 Give it a unique look with our two (2) piece easy-to-apply Simulated Hood Vent Decal Kit. The DuraCOLOR manufacturing process for this item features a three dimensional look with simulated chrome and perforated brushed metal highlights. Moreover, the decals are covered with a 2.5 mil clear laminate which will protect them from miles of abuse. Two (2) piece kit is designed and manufactured to fit the distinct factory hood indentations of the '11-'14 Dodge Charger as shown in the image and will not fit any other vehicle. While vents appear to be 3-dimensional in the image shown, the kit consists of non-functional flat decals uniquely designed with a 3-D tactile appearance. Thus, cutting of the Hood is not required.